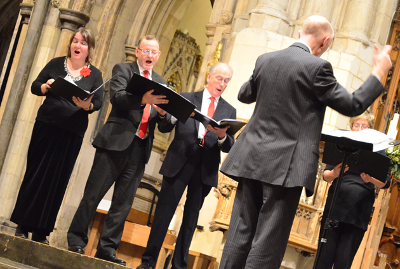 Based in Tunbridge Wells, this versatile choir was founded in 1993. Quorum is equally at home with the music of Byrd and Bach as it is with Wesley and Whitacre. The choir has been involved in a number of charitable concerts, raising money for Help for Heroes, Riding for the Disabled, Crisis at Christmas, and many church appeals. For the last four years we have sung at Southwark Cathedral for the charity Feed the Minds Christmas Concert, and will return in December 2018. We have performed madrigals in the Tudor Chapel at Ightham Mote for a National Trust Garden Party, and taken part in the Mayor’s Charity Concert at the Stag Theatre, Sevenoaks. Recently we gave a Lunchtime Concert in Arundel Cathedral, and have been invited back in 2019. We regularly sing Choral Evensong from the Book of Common Prayer at our home base of King Charles the Martyr.